Plugging our cars into the mains electricity supply when we get home at night might still might seem about as natural as shovelling coal into them before setting off in the morning, but all the signs are that's going to change. Hybrid cars were a first step in the direction of increased use of electricity to drive our vehicles and fully electric models will be the next. 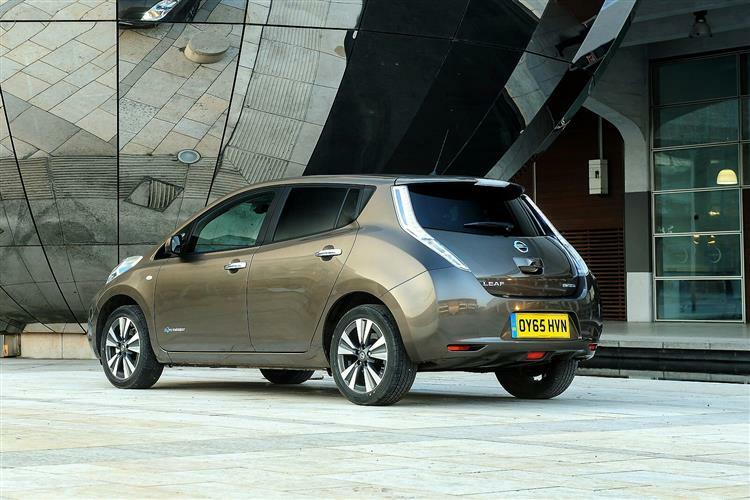 Owning a car that will never go near a filling station forecourt except to use the jet wash or inflate its tyres might take some getting used to but Nissan has long been confident that its LEAF all-electric family hatch can make the transition a painless one. In 2013, the brand upgraded the first generation version of this design with an increased range and quicker charging time. This is the version we check out here as a potential used buy. 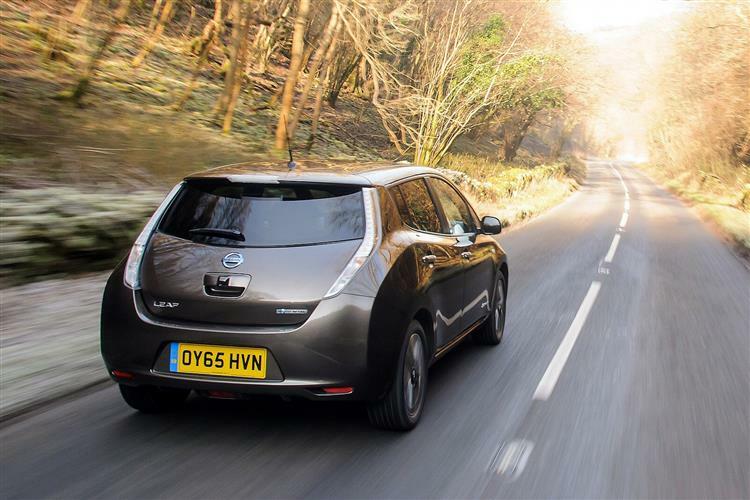 The 'LEAF' name is an acronym for 'Leading Environmentally friendly Affordable Family car' - which is exactly what this was when first we saw it launched in 2011 as the first purpose-designed pure electric vehicle on the market. Back then, the only other offering in this segment was hastily converted citycar design sold under different badges by Mitsubishi, Peugeot and Citroen. 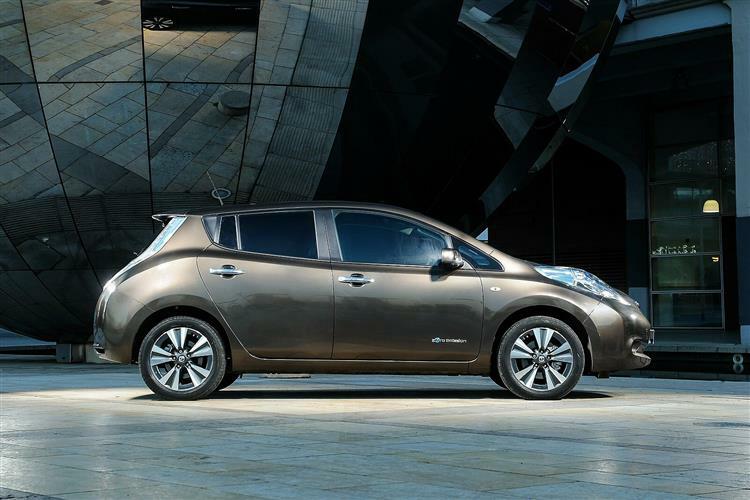 In comparison, the prospect of spending similar money on a larger, more advanced Nissan LEAF seemed like a no-brainer decision for anyone seriously considering a car of this sort. The problem for Nissan, in the UK at least, was that in the early years of the 21st century's second decade, hardly anyone was considering buying a full-electric family vehicle. And certainly not one costing close to £30,000. A LEAF might have been better than anything else on offer in this era but it was still beset by the usual EV issues of low operating range and patchy public charging infrastructure. It was, in short, a car ahead of its time. By 2013 though, there were signs that things might be changing and that the public might be warming to this model. By this time, the cost of electric technology had come down and the number of public charging points had dramatically increased. Plus the whole idea of owning a pure electric car had been more widely accepted. 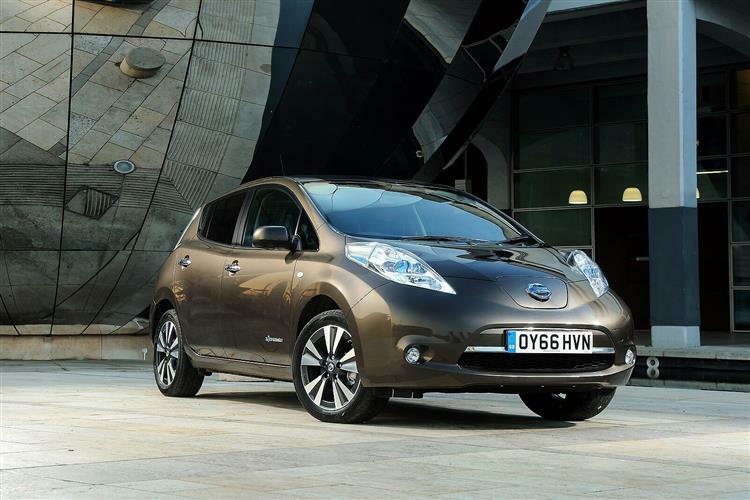 It was a change in mindset Nissan aimed to capitalise on by re-launching the LEAF with a smarter, more practical interior and a longer operating range. This model sold until an all-new second generation LEAF which a much longer operating range was introduced at the end of 2017. The LEAF was the first mass production electric vehicle to be designed from the ground up for purely battery power. Early EVs were merely conversions of cars originally created with petrol engines. Even if you didn't know this, you could perhaps guess the fact from a glance at this dramatic-looking Nissan. For example, since, as an all-electric car, there was no need to fit a bulky engine in the front, it has a stubby and sharply-angled nose that produces a smart wedge profile and aids the strong aerodynamic performance. With this revised post-'13-era model - British-built in Sunderland - that nose also had to also accommodate the bulky charger and inverter which previously took up space in the boot, but the designers managed to sort that without affecting the bonnet line. So, as with the original version of this MK1 model, the so-called 'smart fluidity' looks remain a little unorthodox - subtle grille changes are the only visual update over the 2011-era model. That and the addition of an LED light under the charger lid which makes it a bit easier to connect up at night. Otherwise, nothing's really very different and the futuristic styling remained unaltered - but then many will feel that to be wholly appropriate for such a groundbreaking car. The quirkiest detail is probably the raised profile of the blue LED headlamps, positioned to channel air away from the wing mirrors and reduce road noise. Things get a little more bulbous around a rear end dominated by a kicked-up roofline and gently curved vertical tail lights - and of course notable for the total absence of an exhaust pipe. There is of course a battery instead, as before a 48-module lithium-ion powerpack that isn't housed in the boot but under the vehicle's floor, helping create the low centre of gravity that helps so much with the handling. But the perhaps the most important thing is the overall size. At around 4.5m long, this was the first pure electric car big enough for proper family use, no more than around 200kgs heavier than a similarly shaped conventional model and offering cabin space and overall dimensions very comparable to that of a conventional Ford Focus-style family hatchback. 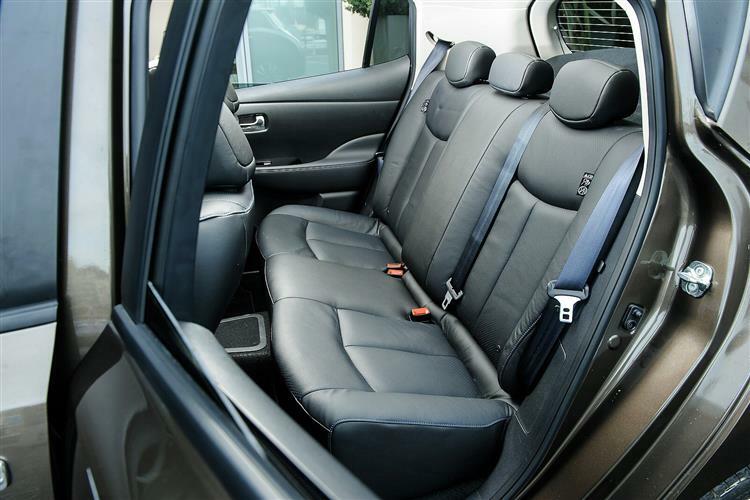 Back in 2013, no other EV on the market could offer you more rear seat space. 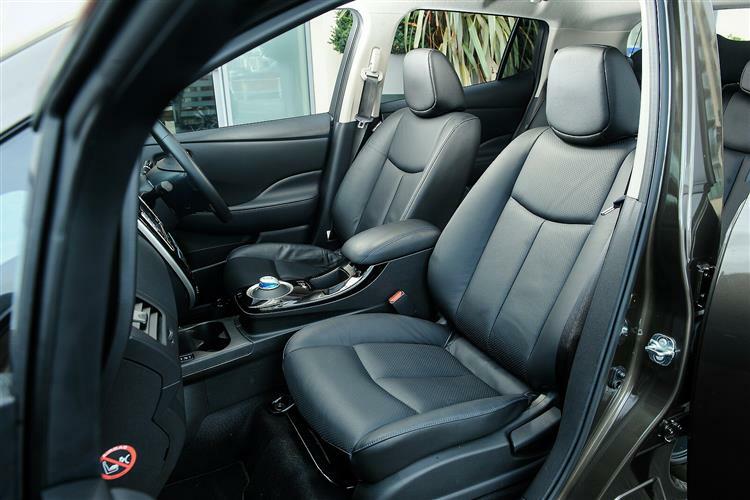 Thanks to redesigned front seats that freed up another 53mm of legroom for rearward folk, the bench in the back of this post-'13-era model can comfortably accommodate three adults on short journeys, two on longer ones and a trio of kids all day long. The important practical news with this revised MK1 model LEAF though, lies further back. We mentioned earlier that the charger and the inverter the battery pack needs were moved forward from the boot to the bonnet in this revised MK1 model. Well that made a big difference to the cargo area. Luggage space in this post-'13-era design is rated at 330-litres, a 40-litre increase over the original car - about the size of a piece of airline carry-on baggage (though top models lose 15-litres of that thanks to the need to house the sub-woofer of the punchy Bose stereo). More importantly, when you push the 60/40 split-folding rear bench forward (something you can't do in a rival Renault Fluence ZE all-electric hatch model from this era), you get a completely flat loading floor. True, the total cargo room on offer isn't especially big: the 1,100-litre total potential seats-folded luggage area that you'd expect when travelling two-up in a conventional family hatch is reduced here to just 680-litres. But we can't see that unduly bothering too many potential buyers. The reason the boot isn't bigger is that the lithium-ion battery pack is mounted beneath the floor of the vehicle, a more pleasing consequence of which is the slightly raised driving position you get behind the wheel. On this improved MK1 LEAF model, there's also the bonus that you can further adjust your seat for height should you want to. Unfortunately, the more pressing change needed in this cabin - the adoption of a reach-adjustable steering wheel - was in 2013 still on Nissan's to-do list. Still, you can move the thing up and down and with a bit of jiggling about, it's possibly to achieve a pretty comfortable driving position. In a cabin that seems very different from that of the original model - until you realise that apart from the adoption of a foot-operated handbrake, the only major change is the adoption of a darker palette of plastics. The original light-coloured trim looked very modern but proved pretty impractical for the cold muddy climates of Northern Europe and Scandinavia. As with the original MK1 LEAF design, there's an appropriately futuristically styled split-level dash, with blue-tinted graphics that look pretty conventional until you peer closer and find that they're primarily geared towards advising you just how much further you can go before a charging top-up is needed. A mobile 'phone-style percentage reading is also included on this revised model. The graphics advise you of your success in regenerating electricity and there's an eco-indicator to display the status of electricity consumption, with little tamaguchi-like trees growing on the display, depending upon how frugally you're driving. 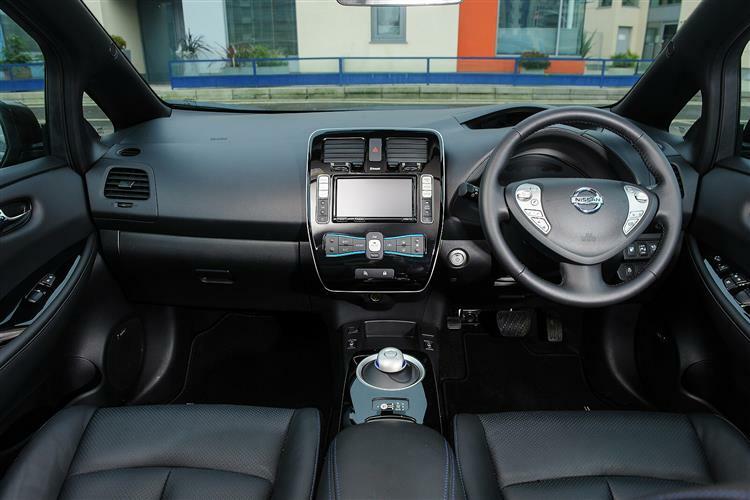 Further range information is provided by various functions that reside on the large telematics screen positioned in the middle of the centre console, powered by a system Nissan calls Carwings. Mid and top-spec models got it as standard and were priced from new to include a five year subscription to the system, which was updated in this revised post-'13-era model to be even more useful. As well as the usual stereo, sat nav and Bluetooth functions you'd get with a conventional infotainment set-up, this one also knows where every public charging point is and is always ready to direct you to one. You can also access Carwings remotely via your PC or smartphone, planning a trip in advance or setting a timer to cool down or warm up the car before a journey so that you don't have to use valuable battery power doing so once on the move. The heating and windscreen demister aren't as 'off limits' in this respect as they were in the original LEAF model though, thanks to a heating system in mid and top-range models that in this revised version was 70% less power-hungry. Reported reliability has thus far been impeccable, due in no small part to the inherent simplicity of the LEAF's drivetrain. 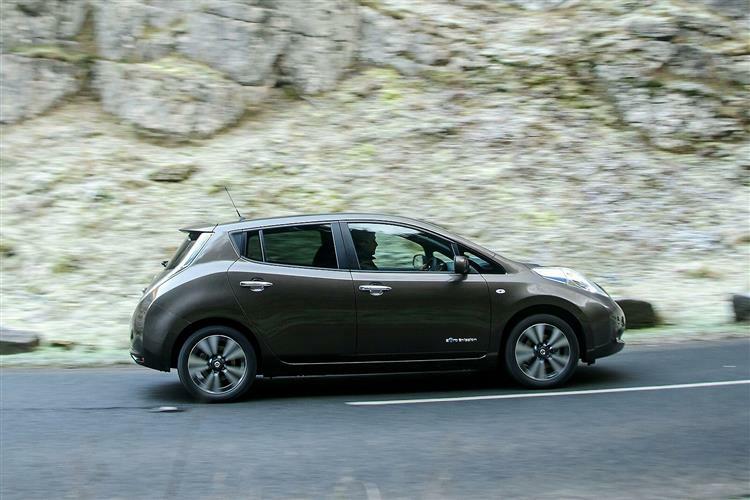 The Leaf doesn't have a transmission as such, instead relying on a reduction gear. The motor is always connected to the drive shafts. This makes it very simple and very reliable - much more so than any type of transmission in any other vehicle. Check that the annual battery checks have been conducted but other than that, there's really not too much to look out for other than the usual supermarket and kerb bumps and scrapes. If possible check the car's battery health before purchase. One that has had lots of regular charges is better than one that's been stood at 100% for days on end. This improved LEAF reverted to a traditional handbrake which seems to be more resilient. It also appears to have a more resilient battery. Some buyers in our survey reported a leaking roof seal and many have reported some uneven tyre wear. There was a recall for checking the steering on earlier version of this improved LEAF: check it was done. One buyer we found had the brake regeneration sensor fail at about 50,000 miles. Another owner experienced a bit of suspension wobble at 70mph. Look for uneven tyre wear, especially at the rear as some cars are known to have tracking issues that are hard to fix. Also, listen for a slight clonking sound from the rear wheels when reversing slowly. Also check for tiny rust spots on the door sills when the doors are open and where the rear screen meets the bootlid. It seems the paint is very soft and prone to scratches, so ideally you'd get a LEAF in a colour that disguises it - i.e not black! (approx values for a 2014 LEAF) What replacement parts are you really going to use? There's no clutch, no exhaust, no spark plugs, no filters, no alternator and no starter motor to worry about. Brakes and tyres are about the only consumables you really need to keep on top of and they're relatively cheap with front brake pads costing around £20 per set while the Bridgestone Ecopia tyres in the LEAF's modest 205/55R16 size are around £67 per corner. We found a pair of brake discs at about £56, which seems reasonable. Wiper blades are at the £10 to £12 mark and a wing mirror glass would be about £15 to £20. A wheel bearing kit starts from around £186. Let's start with the headlines. This improved post-'13-era MK1 model LEAF can travel nearly 20% further than the previous version could on a single charge and, if you get the right specced model, you can finish that charge in half the time. If that's enough to get your interest, then let's get behind the wheel and see what it's like to drive. Get yourself settled and if you've tried an early 2011 or 2012-era MK1 model LEAF, you'll find that things here aren't very different. If you haven't, then the whole experience will seem very futuristic. Initially, it feels just like the Focus-sized family hatchback it is. But release the parking brake (changed to foot-operated functionality in this post-'13-era car) then push the starter and the electric experience begins. Virtual instrument graphics spring up in front of you accompanied by a cheery chime before a few seconds later, you're ready to pull the mouse-shaped auto gear selector into 'Drive' (electric cars are of course always automatic) and set off. But before you do, a quick check is needed of the all-important range indicator, designated by an instrument display bar graph and the mileage figure displayed beneath it. It's a display you're going to get very used to staring at since it'll determine exactly how and when you can use this car. In the mid-part of the 21st century's second decade, brands like Tesla were showing that a range of 250 miles or more was quite possible with very expensive electric vehicles. Affordable EVs though from this period though, couldn't get anywhere close to that but amongst these, this Nissan could claim the mantle of 'best of the rest' thanks to an increase in claimed operating range from 110 to 129 miles for this revised post-'13-era LEAF model. That was achieved thanks to a 30kg weight reduction and the installation (on mid and top-range variants) of a clever heat pump using three times less energy than would normally be required to heat the car. How? By drawing that energy from the air outside, a technology approach well established in domestic use. In the real world of course, you won't regularly achieve the kind of total range Nissan talks about unless you habitually drive like a nun. But the difference the 2013 model year changes made allowed a three figure operating range to be for owners less of a pipe dream and more of an achievable reality, especially if they were able to make good use of the useful 'B' mode in the gearbox. Select it rather than the usual 'Drive' setting and you'll increase the energy that can be harvested from regenerative braking and therefore extend the distance you can travel. In our tests, we commonly got around 80 miles out of a single charge, but that'll still be sufficient to satisfy the 80% of drivers whose daily mileage is less than that. Of course, range is less of an issue if charging is quick and easy. When one day, the 50kW rapid chargers that can replenish a depleted battery to around 80% of its capacity in just 30 minutes are commonplace on our major routes, no one will think twice about taking an EV vehicle on a longer trip. Currently though, such a journey takes a little more forward planning - though a couple of things do make that process easier. First, if you do get to the perspiration point when, 7-8 miles from empty, you find a voice prompting you to find a recharging point as a 'low charge' turtle' graphic appears on the dash, there's always the Carwings telematics system that most LEAF trim levels offer to help you out. This always knows where the nearest public charging point is and can direct you straight to it. Some owners helped themselves to avoid that scenario by paying extra for an optional 6.6kW on-board charging system which was designed to halve charging time to as little as four hours - and does, providing you can find a 7-pin socket to plug it into. As you might expect, over-exercising of your right foot depletes the batteries very quickly and means plugging in much more often. In fact, it's actually more tempting than you'd think to drive this car quicker than you intend to. Or at least it is powering off from rest. Come to a LEAF with electrical expectations based around milk floats and golf carts and the way that 100% of the torque is available right off the bat never fails to feels shocking. From rest to 30mph, this Nissan accelerates faster than a petrol V6, but progress slows as the revs rise culminating in an 11.5s 0-62mph time that's no better - but certainly no worse - than a conventionally-powered rival diesel model. Power comes courtesy of a 360-volt electric motor putting out the equivalent of 109PS and a pokey 280Nm of torque as this unit revs, rather promisingly, to over 10,000rpm. It'll only do 90mph flat-out, but of course, outright speed isn't the point of this car. No, its natural habitat is an urban one that'll see you trundling along in eerie silence. Actually, it's not quite silent. While designers of conventional cars bust a gut to get noise levels down, Nissan actually had to add sound to this one to counter public fears that quiet electric vehicles might, as they approached, unpleasantly surprise unwary pedestrians and the visually impaired. Hence the speaker fitted in the engine bay that produces a low whine at under 15mph to warn the pavement-bound of your impending arrival. Those LEAF owners of a nastier disposition can switch this off. In town, it makes most sense to drive this car in its 'Eco' setting, which on the original version of this car combined a slower throttle response with extra regenerative braking to increase operating range by about 10%. The problem with that was that on the open road, where you don't want a slow throttle response, owners couldn't get the benefits of extra regenerative braking. Which is why on this revised model, the two systems were re-designed so that they operated independently. Get beyond the city limits and you can disable the lethargic throttle response via an 'Eco' steering wheel button but at the same time snick the gearlever from 'D' to 'B' to still harvest the extra braking energy. And handling on faster twisty roads? On the original version of this car, this ought to have been quite good thanks to a centre of gravity the same as that in Nissan's 370z sportscar and near-perfect weight distribution. The trouble was with that car that the steering was so ridiculously light and devoid of feel that at the wheel, you felt absolutely no inclination at all to drive it with any kind of verve. With this revised MK1 model, the engineers improved things, with revised damper settings that improved high speed stability and ensured that the car no longer 'floated' rather weirdly when it encountered mid-corner bumps. A bit more weight was added to the steering too. It's still not what you'd call responsive but you do at least get a little more feel for what the wheels are doing beneath you than was the case with the original MK1 model. Turn-in is actually quite sharp and there's plenty of grip - though also still plenty of body roll. Most importantly though for potential buyers, the ride is very good. Nissan is a brand that knows what it's talking about when it comes to electric power, with an EV history that stretches all the way back to 1947. Only with the introduction of lithium-ion battery technology in the 1990s though, did their EV development really take off and a car like their original LEAF become possible. Early all-electric adopters liked it but wished it were cheaper, better to drive and could go further on a quicker charge. So in 2013, Nissan delivered this improved model offering small but significant improvements in all these areas. Of course operating range, improved though it was, still remained an issue. Nissan wouldn't get around to properly improving that until the second generation version of this design was launched in 2017. That may not matter to you though, especially if your LEAF is to be a second or third family car used for short trips only. Even with that caveat, a LEAF won't be for everyone of course. Those without a garage will join single-car families and long distance commuters in dismissing it out of hand. But then, no car is for everyone. As the Japanese brand points out, you wouldn't buy a GTR supercar for family use or a Navara pick-up as a city run-around. 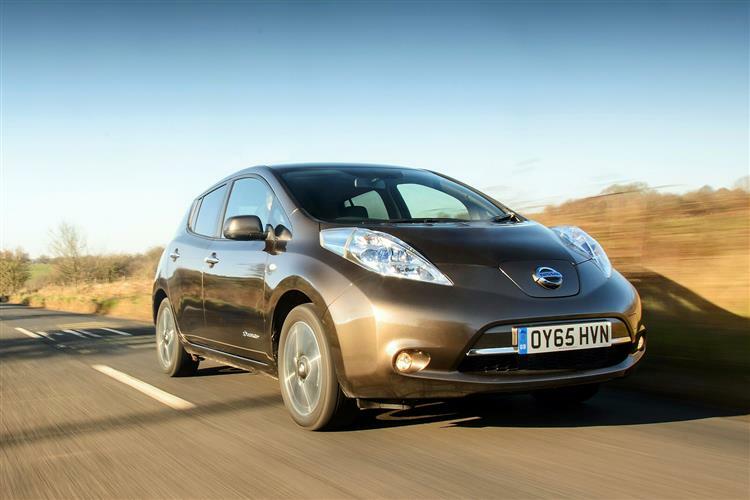 Where Nissan did succeed with this improved MK1 model LEAF though, was in offering a relatively affordable family-sized pure electric car that was much more free of compromise, a model you could pretty painlessly switch into from something conventional. For the right sort of customer, it's a very forward-thinking kind of used car buy.